So so so good!!! The soup is creamy and flavorful! The uni flavor is not overpowering for those who may be a bit turned off by the ocean taste. It’s just so yummy!! 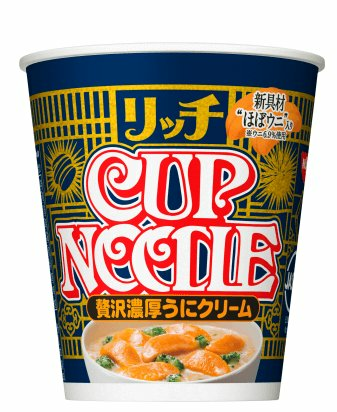 Shop Japanese sea urchin instant noodles in cream cups 72g online at Hommi.We ship worldwide,free International Shipping over 8000 yen.See Price, Brand, How to use, Images, Customer Reviews, Questions & Answers for Japanese sea urchin instant noodles in cream cups 72g.Customers who viewed this item also viewed Pikachu Instant noodles,Ibea Akeba's fried noodles,Samyang Ramen / Spicy Chicken Roasted Noodles 140g K,Japanese local flavors Hand-Pulled Noodle series,Fujiwara noodle Sapporo Maruyama Zoo ramen salt Ueno panda Soy sauce.You can also buy Nissin RA OH Large bowl of Instant noodles 4 kinds of flavors optional,Nissin Shop of ramen Wakayama 130g,CISCO Chocolate chocolate burst,nissin Almond curd pudding powder 60g,Nissin European style cheese curry cup instant noodles D and more nissin at Hommi.